More than 30 parents voiced their opinion on proposals to build a Halfway Park Primary School and a Newton Primary School at a public meeting arranged by South Lanarkshire Council. Also on the agenda at the meeting, which was attended by local politicians, was the rezoning of the existing Hallside Primary School. Hallside Primary, which currently has a roll of 555 pupils, has seen an increase of 150 children in eight years. The proposals aim to tackle the recent influx of pupils in the Newton area due to significant housing development as well as ease the pressure on Cathkin High School, which is close to capacity. 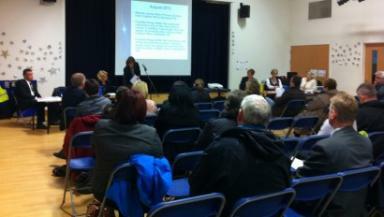 However parents of pupils who currently attend Hallside Primary School are disappointed in the council’s moves. Jacqueline Airnes, who has a son at the school, said: “Cambuslang is a community but these proposals will split the community into three. “Children are just numbers to the council. Eight years ago when the council built Cathkin High School they did not do their job properly. The council is proposing to build a school for 200 pupils at Halfway Park to open in August 2013. The pupils from Halfway Park would attend Stonelaw High School, relieving pressure on Cathkin High. The consultation document also includes plans to open Newton Primary School by 2015, with pupils from the Newton area expected to attend Uddingston Grammar School. Pupils at Hallside, which would be refurbished as part of the proposals, would continue to attend Cathkin High School. Head of Education Resources, Sara Fellows said: “The proposals are trying to consolidate education resources in the whole area and at the same time trying to improve the quality of education within the role of the Curriculum for Excellence. “This is the council’s preferred option but we are looking for feedback. To date we have received just over 100 responses. A number of parents voiced concerns about the separation of families and peers at the meeting. Pupils whose brothers or sisters went from Hallside Primary School to Cathkin High will also be able to go on to Cathkin, without submitting a placing request, until 2020. Although the proposals will rezone Hallside Primary School - therefore excluding pupils from both Halfway Park and Newton - pupils whose brothers and sisters attend Hallside will have the chance to do so themselves until 2021. Transport will be provided for those pupils who live more than two miles away from their catchment secondary school. Anne Rooney, the head of education for East Kilbride, Rutherglen and Cambuslang, said: “The clear messages that came through last year from our consultation exercise was the anxiety of families that children from one family are going to two different schools. “This transition is crucial and important to us who work in education as we know that children get one chance in education and we will work with the parents and families to make sure it’s as smooth for your family as if we hadn’t made the changes. “We understand it’s an anxious time. Please, please help us to pay attention to every aspect of these proposals. “These schools are exciting environments for playing in, they have wonderful facilities and there is a real feel good factor. If we can get a solution, and I understand that this is a complex situation, we also want to be able to refurbish Hallside Primary which is under increasing pressure because of space. The council’s Executive Committee has already agreed to rezone Cathkin High School’s catchment which means that from August 2012 pupils at James Aiton Primary School will attend Stonelaw High School. Comments on the proposals should be submitted to the Executive Director Education Resources (Consultation Response), Almada Street, Hamilton, ML3 0AA by December 12.